Although methadone and suboxone (buprenorphine/naloxone) have tremendous benefits in the management of opioid use disorder, unfamiliarity with these treatments can make any clinician uncomfortable and can lead to substandard care for these patients. This summary will shed some light around the basics of methadone and suboxone, as well as give an approach to four key ED encounters with the patient on Opioid Substitution Therapy (OST): withdrawal, acute pain, overdose and pregnancy. Additionally, a 2015 paper published in JAMA by D’Onofrio et al. has demonstrated that suboxone is easy to start in the ED and has been beneficial for patients. As such, The Ottawa Hospital has implemented its very own suboxone-start protocol which we will outline below. Does not require restricted license to prescribe. If not, prescribe their usual dose – this process differs slightly depending on whether it is suboxone or methadone. For both, you should confirm their dose with their usual pharmacy, notify the pharmacy you will be dispensing today’s dose, and prescribe a one time, observed dose in the ED. Suboxone: There are no prescription restrictions. Usual prescriber’s name in the community if known. There is a lack of guidelines on how to approach this specific patient population, and it often relies addressing three key elements: the addiction itself, the pain experience and the underlying psychosocial factors, as denoted below. By addressing all three, you will find the optimal method of helping to manage your patient’s symptoms. Methadone has greater mortality when compared to suboxone in the overdose setting. Modesto-Lowe, V., Brooks, D., & Petry, N. (2010). 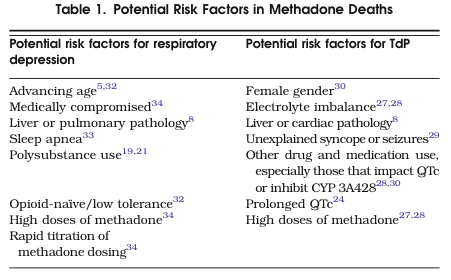 Methadone Deaths: Risk Factors in Pain and Addicted Populations. Journal of General Internal Medicine, 25(4), 305–309. Suboxone is generally considered the safer alternative, given its ceiling effect, but monitoring for respiratory depression and other symptoms should still occur in the context of an overdose. Patients with hepatic disease, pediatric patients, and the utilization of other medications that can precipitant serotonin syndrome, all represent populations would be considered higher risk and should monitored closely. The most important goal with pregnancy and OST is to prevent withdrawal, given there is greater risk to the mother and fetus with repeated episodes of withdrawal. Methadone, which is currently the only OST supported by the evidence for use in pregnancy, is rapidly metabolized in the third trimester, which can lead to early withdrawal. Although OST has been shown to have numerous benefits, there still remains significant barriers to its initiation, specifically lack of access and significant wait times for these services. Given that the ED is often the sole and quickest medical contact for this population, initiation of OST from the ED could address these barriers, specifically suboxone, given its quick titration and favourable safety profile. A study by D’Onofrio et al supported this, showing that if suboxone was initiated from an ED encounter, patients were more likely to remain in addictions treatment (78%) compared to those simply referred to addiction treatment programs (37%), or those receiving a brief intervention in the department (45%). 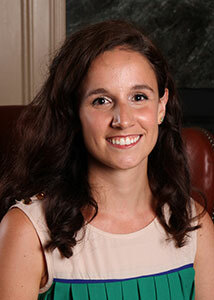 Dr. Isabelle Miles is a 4th year Emergency Medicine resident at the University of Ottawa. 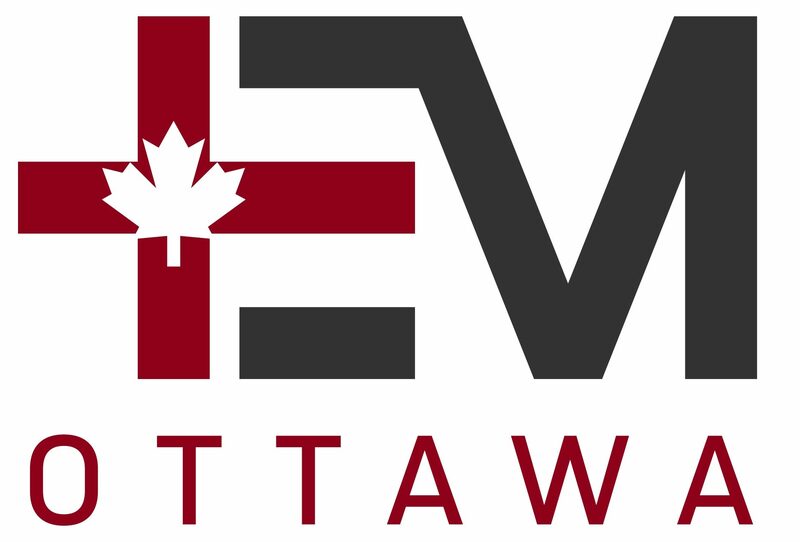 Edited by Dr. Robert Suttie, PGY-2 Emergency Medicine resident at the University of Ottawa. Ahamad, K. et al. (2015). 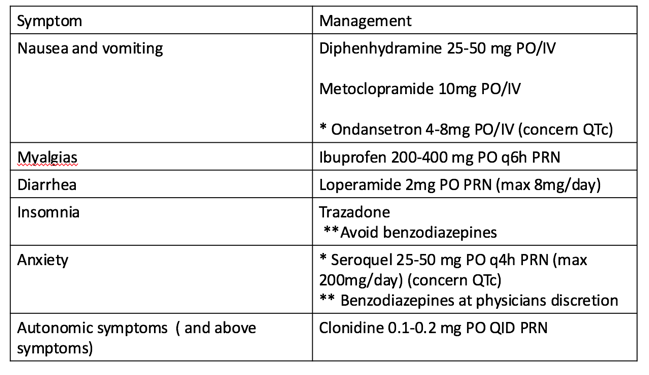 A guideline for the clinical management of opioid addiction. Vancouver Costal Health & Providence Health Care. Alford et al. (2006). Acute pain management for patients receiving maintenance methadone or buprenorphine therapy. Annals of Internal medicine, 144, 127-134. APA (2013). Diagnostic and Statistical manual of mental disorders. 5th ed. American Psychiatric Publishing , Arlington, VA.
Baldacchino, A., Gilchrist, G., Fleming, R., & Bannister, J. (2010). Guilty until proven innocent: A qualitative study of the management of chronic non-cancer pain among patients with a history of substance abuse. Addictive Behaviors, 35(3), 270–272. Bell, J. R., Butler, B., Lawrance, A., Batey, R., & Salmelainen, P. (2009). Comparing overdose mortality associated with methadone and buprenorphine treatment. Drug and Alcohol Dependence, 104(1-2), 73–77. Bournes et al. (2013). Long-term consequences of acute pain for patients under methadone or buprenorphine maintenance treatment. Pain Physician, 16, E739-E747. Bounes, V., Jouanjus, E., Roussin, A., & Lapeyre-Mestre, M. (2013). 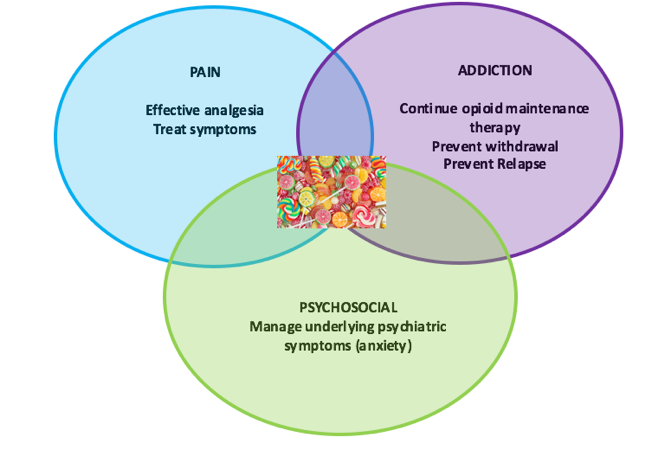 Acute pain management for patients under opioid maintenance treatment. European Journal of Emergency Medicine, 1–4. Canadian Centre on Substance Abuse. (2015). Prescription Opioids. Canadian Drug Summary.Crane, E. H. (2015). The CBHSQ Report: Emergency Department Visits Involving Narcotic Pain Relievers. Rockville, MD: Substance Abuse and Mental Health Services Administration, Center for Behavioral Health Statistics and Quality. CDC. New CDC Opioid Prescribing Guidelines: improving the way opioids are being prescribed for safer chronic pain treatment. CDC NCIPC Division of Uninentional Injury Prevention. 2015. Chen, K et al. (2014). Buprenorphine-naloxone therapy in pain management. Anesthesiology, 120(5), 1262-1274. Chou, R., Cruciani, R. A., Fiellin, D. A., Compton, P., Farrar, J. T., Haigney, M. C., et al. (2014). Methadone Safety: A Clinical Practice Guideline From the American Pain Society and College on Problems of Drug Dependence, in Collaboration With the Heart Rhythm Society. The Journal of Pain, 15(4), 321–337. • Chou, R., Weimer, M. B., & Dana, T. (2014). Methadone overdose and cardiac arrhythmia potential: findings from a review of the evidence for an American Pain Society and College on Problems of Drug Dependence clinical practice guideline. The Journal of Pain : Official Journal of the American Pain Society, 15(4), 338–365. Clausen, T., Anchersen, K., & Waal, H. (2008). Mortality prior to, during and after opioid maintenance treatment (OMT): A national prospective cross-registry study. Drug and Alcohol Dependence, 94(1-3), 151–157. Compton, P, Charuvastra,VC, Walter, L. (2001).Pain intolerance in opioid-maintained former opiate addicts: effect of long-acting maintenance agent. Drug and Alcohol Dependence, 63, 139-146. Cousins, G., Boland, F., Courtney, B., Barry, J., Lyons, S., & Fahey, T. (2015). Risk of mortality on and off methadone substitution treatment in primary care: a national cohort study. Addiction, 111(1), 73–82. Cousins, G. et al. (2011). Risk of drug-related mortality during periods of transition in methadone maintenance treatment: A cohort study. Journal of Substance Abuse Treatment, 41(3), 252–260. Cunningham, CO, et al. (2006). Attending Physicians and residents attitudes and beliefs about prescribing buprenorphine at an urban teaching hospital. Clinical Research and Methods, 28(5), 336-340. Deering, D. E. A., Sheridan, J., Sellman, J. D., Adamson, S. J., Pooley, S., Robertson, R., & Henderson, C. (2011). Consumer and treatment provider perspectives on reducing barriers to opioid substitution treatment and improving treatment attractiveness. Addictive Behaviors, 36(6), 636–642. Degenhardt, L. et al. (2010). Mortality among regular or dependent users of heroin and other opioids: a systematic review and meta-analysis of cohort studies. Addiction, 106(1), 32–51. Degenhardt, L., Charlson, F., Mathers, B., Hall, W. D., Flaxman, A. D., Johns, N., & Vos, T. (2014). The global epidemiology and burden of opioid dependence: results from the global burden of disease 2010 study. Addiction, 109(8), 1320–1333. Degenhardt, L., Larney, S., Randall, D., Burns, L., & Hall, W. (2013). Causes of death in a cohort treated for opioid dependence between 1985 and 2005. Addiction, 109(1), 90–99. Degenhardt, L., Bucello, C., Mathers, B., Briegleb, C., Ali, H., Hickman, M., & McLaren, J. (2010). Mortality among regular or dependent users of heroin and other opioids: a systematic review and meta-analysis of cohort studies. Addiction, 106(1), 32–51. Dennis, B. et al. (2016). Usefulness of the brief pain inventory in patients with opioid addiction receiving methadone maintenance treatment. Pain Physician, 19, E181-E195. Dooley, J., Asbridge, M., Fraser, J., & Kirkland, S. (2012). Physicians attitudes towards office-based delivery of methadone maintenance therapy: results from a cross-sectional survey of Nova Scotia primary-care physicians. Harm Reduction Journal, 9(1), 1–1. D’Onofrio, G, O’Connor, PG, Pantalon, MV, Chawarski, MC, Busch, SH, Owens, PH, Bernstein, SL, and Fiellin, DA. (2015). Methadone overdose causing acute cerebellitis and multi-organ damage. American Journal of Emergency Medicine, 1–3. D’Onofrio, G., O’Connor, P. G., Pantalon, M. V., Chawarski, M. C., Busch, S. H., Owens, P. H., et al. (2015). Emergency Department–Initiated Buprenorphine/Naloxone Treatment for Opioid Dependence. Jama, 313(16), 1636–9. Dunn, K. E., Finan, P. H., Tompkins, D. A., Fingerhood, M., & Strain, E. C. (2015). Characterizing pain and associated coping strategies in methadone and buprenorphine-maintained patients. Drug and Alcohol Dependence, 157(C), 143–149. Earnshaw, V., Smith, L., & Copenhaver, M. (2012). Drug Addiction Stigma in the Context of Methadone Maintenance Therapy: An Investigation into Understudied Sources of Stigma. International Journal of Mental Health and Addiction, 11(1), 110–122. Eyler, E. C. H. (2013). Chronic and Acute Pain and Pain Management for Patients in Methadone Maintenance Treatment. The American Journal on Addictions, 22(1), 75–83. Fischer et al. (2012) Prescription opioid relate dmisure, harms, diversion and interventions in Canada: a review. Pain Physician, 15, ES191-ES203. Fullerton, C.A. et al. (2014). Medication-assisted treatment with methadone: assessing the evidence. Psychiatric Services, 65(2), 146-157. Gomes et al. (2011). Geographical variation in opioid prescribing and opioid related mortality in Ontario. Healthcare Quarterly, 14(1), 22-24. Gomes, T., Mamdani, M. M., Dhalla, I. A., Cornish, S., Paterson, J. M., & Juurlink, D. N. (2014). The burden of premature opioid-related mortality. Addiction, 109(9), 1482–1488. Gowing, L, Farrel, MF, Bornemann,R, Sullivan, LE, Ali, R. (2011). Oral substitution treatment of injecting opioid users for prevention of HIV infection. Cochrane Database Systematic Review. Gowing, L, Ali, R, White JM. (2009). Buprenorphine for the management of opioid withdrawal. Cochrane Database Systematic Review. Gowing, L, Farrel MF, Ali R, White JM. Alpha 2-adrenergic agonist for the management of opioid withdrawal.Cochrane Database Systematic Review. Grilo, L. S., Carrupt, P.-A., & Abriel, H. (2010). Stereoselective Inhibition of the hERG1 Potassium Channel. Frontiers in Pharmacology, 1, 1–11. Handford, C. et al. (2012). Buprenorphine/Naloxone for opioid dependence: clinical practice guidelines. CAMH. Hillier. W. (2011). Methadone Maintenance Treatment program standards and clinical guidelines. CPSO. 4th Edition. Holbrook, A. M. (2015). Methadone versus buprenorphine for the treatment of opioid abuse in pregnancy: science and stigma. The American Journal of Drug and Alcohol Abuse, 41(5), 371–373. Huxtable, CA, et al. (2011). Acute pain management in opioid-tolerant patients: a growing challenge. Anaesth Intensive Care, 29, 804-823. Isenberg, D., Wong, S. C., & Curtis, J. A. (2008). Serotonin syndrome triggered by a single dose of suboxone. The American Journal of Emergency Medicine, 26(7), 840.e3–840.e5. Jacobs, P., Ang, A., Hillhouse, M. P., Saxon, A. J., Nielsen, S., Wakim, P. G., et al. (2015). Treatment outcomes in opioid dependent patients with different buprenorphine/naloxone induction dosing patterns and trajectories. The American Journal on Addictions, 24(7), 667–675. Keane, H. (2013). 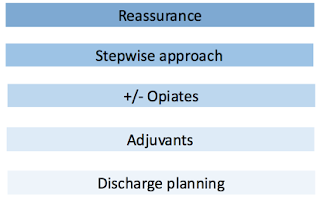 Categorising methadone: Addiction and analgesia. International Journal of Drug Policy, 24(6), e18–e24. Kim, H. K., Smiddy, M., Hoffman, R. S., & Nelson, L. S. (2012). Buprenorphine May Not Be as Safe as You Think: A Pediatric Fatality From Unintentional Exposure. Pediatrics, 130(6), e1700–e1703. King, N. et al. (2014). Determinants of increased opioid-related mortality in the United States and Canada, 1990-2013: a systematic review. American Journal of Public Health, 104(8), e32-e42. Kreek, M. J., Borg, L., Ducat, E., & Ray, B. (2010). Pharmacotherapy in the Treatment of Addiction: Methadone. Journal of Addictive Diseases, 29(2), 200–216. Lee, S. C., Klein-Schwartz, W., Doyon, S., & Welsh, C. (2014). Comparison of toxicity associated with nonmedical use of benzodiazepines with buprenorphine or methadone. Drug and Alcohol Dependence, 138, 118–123. Mao, J. (2015). Clinical Diagnosis of Opioid-Induced Hyperalgesia. Regional Anesthesia and Pain Medicine, 40(6), 663–664. Marteau, D. et al (2015). The relative risk of fatal poisoning by methadone or buprenorphine within the wider population of England and Wales. BMJ, 1-8. Mattick RP, Kimber J, Breen C, Davoli M (2014). Buprenorphine maintenance versus placebo or methadone maintenance for opioid dependence. Cochrane Database Systematic Review. Mattick, R. P., Breen, C., Kimber, J., & Davoli, M. (2009). Methadone maintenance therapy versus no opioid replacement therapy for opioid dependence. Cochrane Database of Systematic Reviews. Methadone Maintenance Program: Clinical Practice Guidelines. CPSBC. September 2015. Moody, D. E. (2013). Metabolic and toxicological considerations of the opioid replacement therapy and analgesic drugs: methadone and buprenorphine. Expert Opinion on Drug Metabolism & Toxicology, 9(6), 675–697. Murnion, B. (2012). 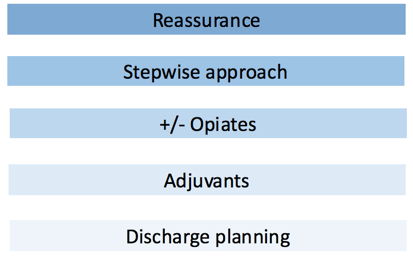 Management of opioid substitution therapy during medical intervention. Internal Medicine Journal, 42(3), 242–246. Murphy, Y et al. (2015). Prescription opioid use, harms and interventions in Canada: a review update of new developments and findings since 2010. Pain Physician, 18, E605-E614. Murphy, S, Irwin, J. (1992). “Living with the dirty secret”: problems of disclosure for methadone maintenance clients. Journal of Psychoactive Drugs, 24(3), 257-264. Nolan, S., Hayashi, K., Milloy, M. J., Kerr, T., Dong, H., Lima, V. D., et al. (2015). The impact of low-threshold methadone maintenance treatment on mortality in a Canadian setting. Drug and Alcohol Dependence, 156(C), 57–61. Noska, A. et al. (2015). Managing Opioid Use Disorder During and After Acute Hospitalization: A Case-Based Review Clarifying Methadone Regulation for Acute Care Settings. Journal of Addictive Behaviors, Therapy and Rehabilitation, 04(02), 1–11. Nosyk, B., Fischer, B., Sun, H., Marsh, D. C., Kerr, T., Rehm, J. T., & Anis, A. H. (2014). High levels of opioid analgesic co-prescription among methadone maintenance treatment clients in British Columbia, Canada: Results from a population-level retrospective cohort study. The American Journal on Addictions, 23(3), 257–264. Nyamathi, A., Smith, D. M., Shoptaw, S., Mutere, M., Cohen, A., Amrani, I., et al. (2007). Perceptions of Methadone Maintained Clients About Barriers and Facilitators to Help-Seeking Behavior. Progress in Community Health Partnerships: Research, Education, and Action, 1(4), 301–309. Poole, S. A., Pecoraro, A., Subramaniam, G., Woody, G., & Vetter, V. L. (2015). Presence or Absence of QTc Prolongation in Buprenorphine-Naloxone Among Youth With Opioid Dependence. Journal of Addiction Medicine, 1–8. Price, LC, Wobeter, B, Delate, T., Kurz, Deanna, Shanahan, R. (2014). Methadone for Pain and the Risk of Adverse Cardiac Outcomes. Journal of Pain and Symptom Management, 48(3), 333–342. Proctor, S. L., Copeland, A. L., Kopak, A. M., Hoffmann, N. G., Herschman, P. L., & Polukhina, N. (2015). Predictors of patient retention in methadone maintenance treatment. Psychology of Addictive Behaviors, 29(4), 906–917. Ray, W. A., Chung, C. P., Murray, K. T., Cooper, W. O., Hall, K., & Stein, C. M. (2015). Out-of-Hospital Mortality Among Patients Receiving Methadone for Noncancer Pain. JAMA Internal Medicine, 175(3), 420–8. Romero, J., Baldinger, S. H., Goodman-Meza, D., Engstrom, K., Valencia, C. R., Golive, A., et al. (2015). Drug-induced torsades de pointes in an underserved urban population. Methadone: is there therapeutic equipoise? Journal of Interventional Cardiac Electrophysiology, 1-9. Salsitz, E., & Wiegand, T. (2015). Pharmacotherapy of Opioid Addiction: “Putting a Real Face on a False Demon.” Journal of Medical Toxicology, 1–6. Sansone, R. et al.(2015). Buprenorphine treatment for narcotic addiction: not without risks. Innov Clin Neurosci, 12(3-4), 32-36. Schuman-Oliver, Z. et al. (2013). Clinician beliefs and attitudes about buprenorphine/naloxone diversion. The American Journal on Addictions, 22, 574-580. Shah, S., Kapoor, S., & Durkin, B. (2015). 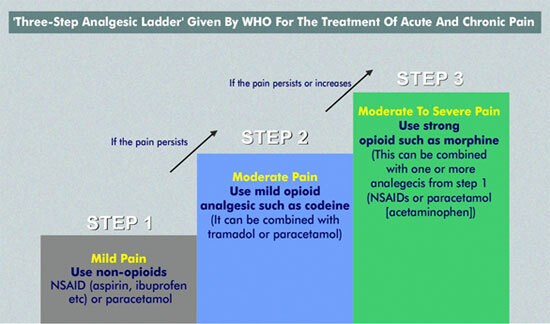 Analgesic management of acute pain in the opioid-tolerant patient. Current Opinion in Anaesthesiology, 28(4), 398–402. Soyka, M. (2015). New developments in the management of opioid dependence: focus on sublingual buprenorphine/naloxone. Substance Abuse and Rehabilitation, 6, 1-14. St. Marie, B. (2014). Health care experiences when pain and substance use disorder coexist: “ just because I’m an addict doesn’t mean I don’t have pain”. Pain Medicine, 15, 2075-2086. Staab,C. (2014). My Trauma Patient Takes Methadone: How Do I Manage His Pain? Journal of Emergency Nursing, 40(5), 509–511. Timko, C., Schultz, N. R., Cucciare, M. A., Vittorio, L., & Garrison-Diehn, C. (2015). Retention in medication-assisted treatment for opiate dependence: A systematic review. Journal of Addictive Diseases, 1–14. Vadivelu et al. (2014). Practical guide to the management of acute and chronic pain in the presence of drug tolerance for healthcare practitioner. The Ochsner Journal, 14, 426-433. Voon, P., Hayashi, K., Milloy, M. J., Nguyen, P., Wood, E., Montaner, J., & Kerr, T. (2015). Pain Among High-Risk Patients on Methadone Maintenance Treatment. The Journal of Pain, 16(9), 887–894. Wachholtz, A., & Gonzalez, G. (2014). Co-morbid pain and opioid addiction: Long term effect of opioid maintenance on acute pain. Drug and Alcohol Dependence, 145, 143–149. Ward, J., Hall, W., & Mattick, R. P. (1999). Role of maintenance treatment in opioid dependence. The Lancet, 353(9148), 221–226. Webster, P. C. (2012). Medically induced opioid addiction reaching alarming levels. Canadian Medical Association Journal, 184(3), 285–286.